Laser eye surgery is a quick procedure that involves reshaping the cornea to correct vision. The surgery is performed using a femtosecond laser rather than a blade, thus minimising the need for physical contact. This bladeless type of eye surgery reduces the risk of infection and promises greater accuracy in the cutting of the cornea. For those of you asking ‘how is laser eye surgery performed?’, here’s a quick guide. Many people are squeamish about the idea of eye surgery, but laser eye surgery is performed with no pain or discomfort to the patient. The entire procedure needs to be carried out while the patient is awake (so that they can control their eye movements and respond to the surgeon’s requests), so a topical anaesthetic is applied to the eyes using eye drops, to ensure that the surgery is entirely pain-free. The first step in the procedure is to produce a flap in the cornea, the transparent layer at the surface of the eye. This can be done using either a sharp mechanical device or a laser. In all his laser eye surgery procedures, Mr Barsam uses a state-of-the-art femtosecond laser to create the corneal flap. The flap in the cornea is lifted out of the way to reveal the corneal stroma (the thick part of the cornea that requires reshaping). 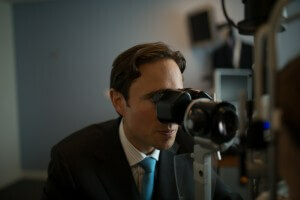 Then, the laser eye surgery is performed using an excimer laser to reshape the corneal stroma. Your eye prescription determines how the laser eye surgery is performed; if you are myopic (short sighted), the cornea needs to be flattened to correct your focus; if you have hypermetropia (long-sightedness), the cornea is reshaped to make it steeper. This can be done extremely quickly, with the entire procedure taking only 10-15 minutes from beginning to end. There is no need to worry about the eye moving while the surgery is taking place – the laser has an advanced pupil tracking function which allows it to follow the movement of the eye or halt the procedure if necessary. 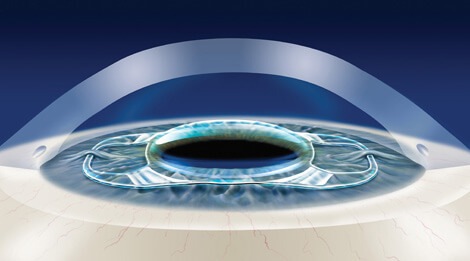 Once the laser has completed its reshaping of the cornea, the flap is placed back over the stroma. The laser eye surgery can then be performed on the other eye. After laser eye surgery is performed, the anaesthetic will begin to wear off and you may feel some mild discomfort. Your surgeon will give you eye shields and / or eye drops to use in the days and weeks following the procedure, and will advise you on post-operative eye care. You will be advised to avoid certain activities like swimming and contact sports, and to avoid dusty environments and bright sunshine. Your surgeon will usually examine you the day after your laser eye surgery and thereafter at regular time periods. It is important that you attend all your post-operative visits. If you have any particular questions or concerns about your own procedure and how laser eye surgery will be performed, it’s important speak to a surgeon to discuss them. They will be able to talk you through the operation, explaining the details and answering any specific questions.